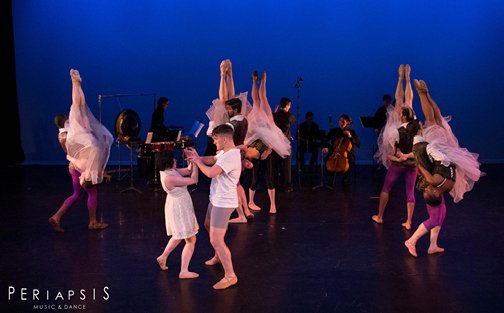 Periapsis Music & Dance bridges the gap between living composers and choreographers. 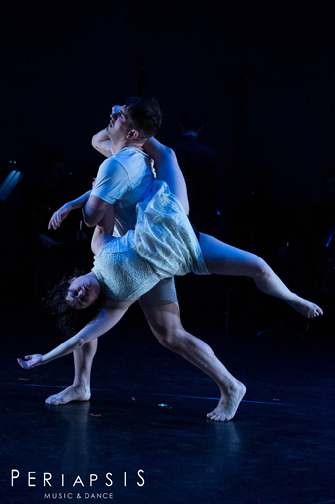 Artistic Director, composer and musician Jonathan Howard Katz collaborates with Artistic Director, choreographer and dancer Leigh Schanfein in creating original works. Their second season demonstrated their unique mission by having music played live on the stage as part of the dance performances. For this season, they also invited guest choreographers and composers. The program opened with a Periapsis piece titled Marionettefadendurcheinanderwalzer set to original music by Jonathan Howard Katz. The dancers move like marionettes, rising up on pointe and performing lovely phrases before turning limp and robotic, sinking on knocked knees, or collapsing to the floor. The gorgeous music veers back and forth from dreamy abstract atmospheres to pretty lyrical melodies. From this very first piece, all I could think about was how wonderful and special it was to have original music played live on stage and how well it worked with the contemporary ballet performance. 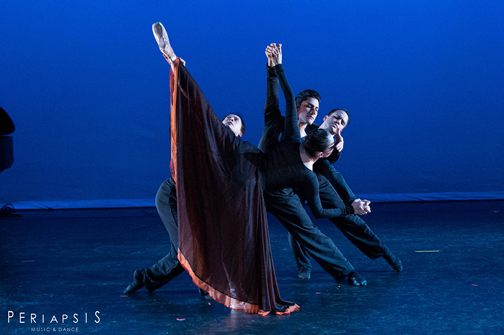 Ursula Verduzco presented the Benjamin Briones Ballet in the world premiere of Pushing Mud. For this piece, the piano is stationed at the back of the stage in one corner, while a cellist and violinist play in the opposite corner. This makes the diagonal across the stage a strong element in the composition of the dance — all exits and entrances and much of the traveling seemed to move along that route. Ms. Verduzco dances the role of an outsider, one excluded from the group, either by her choice or theirs. She falls into place when the company fills the stage, but the dance describes her character as never quite managing to coalesce with the others. Her movement is sultry and dramatic with flamenco elements in the rolling gestures of her hands and wrists and the regal carriage of her chest and head. Her port de bras are luxurious and beautifully expressive. A strong actress, she can also conjure expressions of grief and frustration, both on her face and through her movement. The group travels together, sometimes at very close quarters, while she observes from the sidelines. There is a moody and somber feel to the music, perfectly complemented by the drama of the dance. I especially loved the sweep of the closing phrases of this piece. unguarded also received its world premiere. 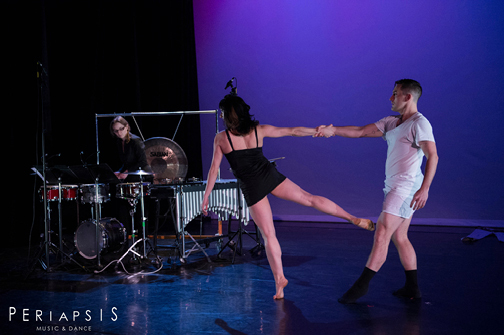 The dance is choreographed by Tucker Davis, and performed by him and Denise Miller to live percussion played on stage by Sarah Mullins. The flirtation between the dancers is quirky, cute and very artistically done. I appreciated the cleverness with which the dance tied in to the music; a cymbal crash sounds to punctuate a humorous phrase of choreography or the movement explodes as the drums rumble. Ms. Miller and Mr Davis are full of personality. They don’t shy away when it comes to taking risks, and they make wonderful partners. The dance never seems to be taking itself seriously and yet it’s performed in such a strong and distinctive artistic voice. 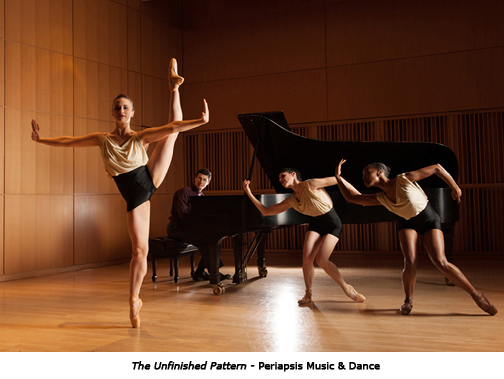 The Unfinished Pattern is choreographed by Leigh Schanfein and performed by Periapsis. In the opening sequence, one dancer stands in a spotlight while another stands in shadows. The two perform their movement in unison, but the lighting creates two distinctly different atmospheres. Schanfein’s choreography is gorgeous and lush — a ronde de jamb on the floor suddenly turns inward with a bent knee, and it feels as if the story being told has just taken an abrupt turn. The dance has a lovely rolling feeling against the percussive phrases in the music. There is lovely detail in unexpected places, using the shoulders, the wrists and the hands. The larger company is exciting to watch too. I was impressed by their technique, their artistry, and the heart with which they dance. Dance Theatre of Harlem’s Da’ Von Doane was named as one of Dance Magazine’s 25 to Watch. His contemporary ballet Behind the Veil received its world premiere. 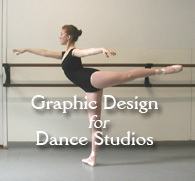 The dance weaves through classical and contemporary movement, flowing with earthiness and elegance. A trio of bare chested men are muscular and sometimes aggressive, moving seamlessly through powerful explosive movement into slow controlled adagio phrases. They accompany Raven Barkley, who dances with great strength and power. Lut Ave Dontralus comes out of The Julliard School. Three vocalists take up different stations around the stage as they sing. Joseph Davis and Cleo Person, both dressed in white, perform a high energy modern duet which weaves around the vocalists. The dance is edgy, full of quick and sometimes aggressive movement, which changes direction rapidly. 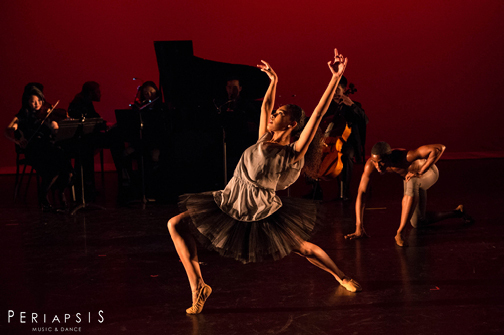 Ruth Howard’s choreography beautifully complements the details of the original composition created by Zachary Green. The program closed with Laid Upon the Children, based on the story of Romeo and Juliet, specifically the party scene and the crypt scene. This piece is another collaboration between the artistic directors of Periapsis. Mr. Katz talked about Ms. Schanfein’s wanting to present swing dance in the party scene, and his taking on the challenge to compose a swing section, even though he wasn’t used to composing jazz. The first section, Too Like the Lightning includes staccato movement with flexed feet and hands. Couples travel the floor in unaccustomed ways. They weave through well recognized ballet phrases then move in new directions, sometimes in parody of the stiff court dances that we sometimes see in classical ballet. The swing section is great fun, and the dancers seemed to enjoy performing it as much as the audience enjoyed watching it. It is in this scene where Romeo and Juliet first see each other across the crowded room. The crypt scene, Grace for grace, is heartbreaking and beautifully performed by Tucker Davis. A strong actor, Mr. Davis lets us feel his grief without any great displays of histrionics. He dances with the lifeless body of his Juliet (Hannah Weber), dragging her, crawling under her, trying to get her to embrace him, doing everything he can think of in futile hope of animating her. A very emotional and sad piece, well acted and danced, especially at the very end. I love the mission that Periapsis Music & Dance has undertaken, to bring living composers together with choreographers and dancers. It is carried out beautifully by the company’s very capable ADs. Though they are a young company, they appear to have assembled a good sized repertoire in the two years that they’ve been working together. I found the choreography and dancing to be very compelling and the music to be magnificent. I look forward to seeing where they take things from here. This entry was posted in Dance, Karen and tagged Benjamin Briones Ballet, Da' Von Doane, Jonathan Howard Katz, Leigh Schanfein, Periapsis Music & Dance, Tucker Davis, Ursula Verduzco. Bookmark the permalink.